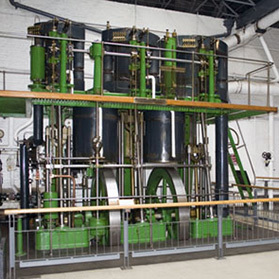 Compared to the beam engines, this engine is of fairly modern design and represents the most common type of pumping engine built for waterworks after about 1900. It is usually considered to be an intermediary stage in development between beam engines and internal combustion engines. The cylinders are inverted and placed in a line directly over the crankshaft in much the same way as a modern car engine. The idea for using such engines in waterworks came from America around 1880 and soon gained popularity. The example at Kew Bridge was built in Leeds in 1910 by Hathorn Davey & Co. and was previously in service in a pumping station at Newmarket. The engine was donated to the museum by the Anglian Water Authority. As with the Dancers End engine, the Triple drove its pumps from extensions to the piston rods – in this case four smaller rods can be seen on each cross-head driving down into the sump of the engine. Due to headroom restrictions, the pumps are no longer fitted to this engine.